When I visited Asheville, North Carolina last month, I discovered a new place to love. K2 Studio is this amazing home decor shop to peruse. You'll be surpised at how many unique items there are, as well as how bad you'll want to redesign your entire home after just one visit. You'll find all variations of home furniture and accessories here. I especially liked the set of three lights made of olive buckets and a chicken feeder. When you walk inside K2, you'll most likely find the owner, Kim Hubbard. Kim is passionate about design and works with many local artisans to create unique pieces for her customers. I think that's what I loved most about her space- all the items I've never seen before. On my second visit to K2, I had the pleasure to sit with Joyce Hunter, the Sales Manager to learn more about the shop. Joyce describes her and Kim's design philosophy as "eclectic, organic and local." You will find that almost half of the items in their shop come from local artists, including this gorgeous poplar and reclaimed mahogany table handcrafted by Ronno Cooke of Morganton, NC. Much of K2's furniture comes from the fabulous Younger Furniture of Thomasville, North Carolina. They make stylish pieces that don't break the bank. As Joyce shared, "We stay within a price point that is reasonable for everyone. We don't have $10,000 sofas." Plus, K2 offers dozens of incredible fabrics to upholster your favorite find. Joyce's current favorite accessory is this grouping of 10 flexible vases. As she shared, "I can put anything in them and it looks good. It's just fun." Original artwork is found throughout K2. 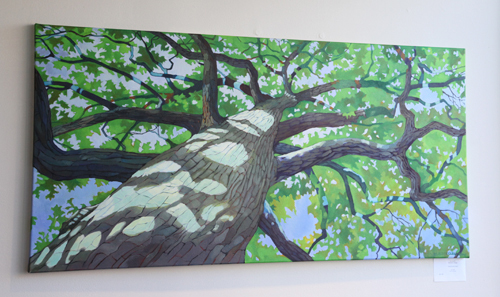 "Horizontal Oak" is an oil on canvas painting by local artist, Rachel Clegg. 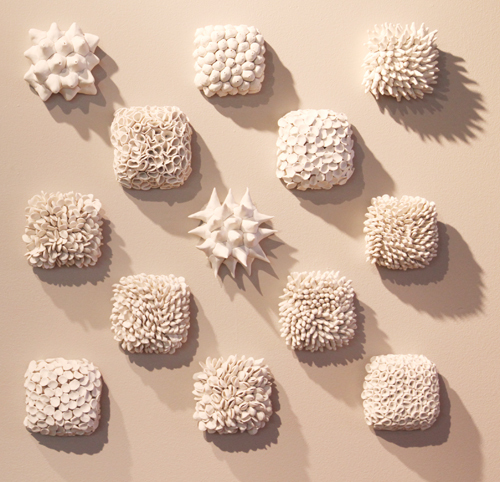 I immediately recognized the work of one of my favorite Southern artists, Heather Knight of Asheville. She's so incredibly talented. Her wall tiles and ceramic bowls always stop me in my tracks to admire and wish and wish into my life.